Golden History Museum opens its doors with free admission from 5 to 9 pm for Night at the Museums. Explore the Museum with a scavenger hunt to find clues and solve the mystery at Golden History! Test your answers on our interactive switchboard and win a prize if you hear the joyous sounds of your victory. See brand new exhibits, including Legendary People which includes biographies of important locals, as well as Epic Events, a timeline of the major events and discoveries that shaped Golden. 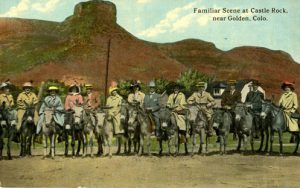 The entire family will want to take a selfie in front of a huge photo backdrop depicting tourists with donkeys – once a common sight in Golden. Free. All ages. There is no registration for this event.